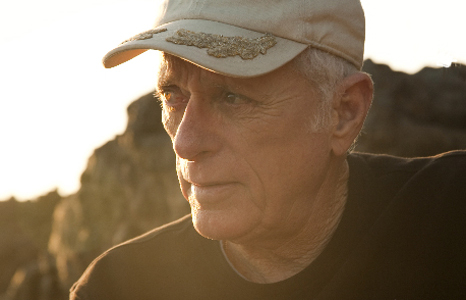 Marine mammal specialist, Ric O’Barry has worked with dolphins for the vast majority of his life. He spent the first 10 years of his career in the dolphin captivity industry and the past 38 years fighting against it. Most recently, Ric’s biopic, THE COVE, won an Academy Award for Best Feature Documentary in 2010. Working for Miami Seaquarium in the 1960s, Ric was responsible for capturing and training dolphins, including five dolphins who played the role of Flipper in the popular television series of the same name. When one of the famed dolphins, Cathy, died suddenly in his arms, Ric decided that taking dolphins out of their natural habitat and training them to perform tricks was wrong. From that moment on, Ric knew he must rededicate himself to a new cause. On the first Earth Day in1970, Ric founded the Dolphin Project, an organization that aims to free captive dolphins and to educate people throughout the world about the plight of dolphins in captivity. Ric believes that this campaign exposes the public to what really goes on at dolphin shows and urges people not to support such forms of entertainment. With more than 45 years of experience, his firsthand knowledge about the methods used to capture and train dolphins has taken him all over the world to participate in lectures and conferences about the controversial dolphin captivity issue. To recognize his contribution, in 1991 Ric received the Environmental Achievement Award presented by the United States Committee for the United Nations Environmental Program (US/UNEP). Ric received the ASPCA Lifetime Achievement Award in 2009. Ric authored Behind the Dolphin Smile, which was published in 1989. Ric authored Behind the Dolphin Smile, which was published in 1989. As well as a second book, To Free A Dolphin, which was published in September 2000. A third book is in the works. Ric is the Marine Mammal Specialist for Earth Island Institute and Director of the Save Japan Dolphins coalition. ARZone: Hi Ric, and welcome to ARZone! The dolphin hunters in Taiji have described their actions as being necessary as a form of “pest control”. The Japanese Govt. seem to believe the world’s oceans are an infinite resource for their self gratification. How do we use education as a tool to turn this around? Richard O’Barry: They are wrong. They need to look at themselves and realize the problem is over-fishing. Not the dolphins. I think the best tool I’ve seen so far is the movie THE COVE. It’s not just about The Cove and dolphins; the oceans, over fishing and mercury contamination are all factors. There are 127 million people in Japan, most of who have yet to see THE COVE. Part of our work is trying to ensure that happens. We are also trying to get it on the internet for free download. It’s not really my movie, I am just in the movie. The filmmakers have moved on to their next film project, I’m still working at the cove in Taiji, Japan trying to stop the dolphin slaughter and the related captures for zoos and aquariums. So, I think that’s the best tool, films like THE COVE, which are both educational and entertaining. Ric, ARZone is dedicated to educating people about the obligations we all share towards all other living beings. It can be difficult to explain to others why every creature deserves to live. Most people don’t think much about mice and garden snakes! Some animal advocates claim that people who focus their advocacy on one species do so because the “cute” or “intelligent” animals are somehow easier to save, for example, that people relate easier to “smiling” dolphins or “cuddly” arctic foxes. In your experience, is advocating for marine animals easy, and are people readily accepting of what you are trying to do? First, let me say I focus on dolphins because you can spread yourself so thin that you never accomplish anything. I am staying focused on the plight of dolphins like a laser beam. I see dolphins as a reference point in nature. But you’re right, the dolphin is no more or less important than any other living being. They are all equally important. Thanks for your question, Tim. It’s often heard within the animal advocacy movement that when people campaign to “save the whales” and only the whales, that the implicit message is sent that all other creatures matter less, or not at all. Have you heard this sort of criticism of your work, and if so, would you like to respond to it now? That’s much the same question. I do focus specifically on dolphins. But I’m also as concerned about homelessness and other issues. Unfortunately, I can’t do very much about homelessness, and other equally important issues. I helped create this dolphin amusement park industry, which is one reason why I focus on the dolphin captivity industry. Not because I believe they’re more important. It’s about being effective, and this is how I am as effective as I can be. Humans have been doing “research” on dolphins since 1938 when the industry first started in Marine Studios in St Augustine. Why have we not learnt that this “research” is merely… a guise for the commodification of another species, and why do you think this is still allowed to continue after 80 years? I have learned that research creates grant money. So a lot of “researchers” have repeated the same research over and over again, for this reason. It’s all about grant money. But we have done enough research with dolphins to know they are sonic creatures in a concrete box. We’ve done enough research to know that the captivity of dolphins and other whales is a failed experiment. Why are the words “research” and “education” being used? This is a major problem. When using these words, humans can get away with murder. That’s why they continue to use those two words. You are the manifestation of someone having a change of heart based on new awareness. As such, your work to educate the public about dolphin slaughter has achieved success. But since the same thing is happening to nearly every type of animal on the face of the earth, does it motivate you to take more global action by advocating for a new relationship between human and nonhuman animals? To promote veganism? I thought I was already doing that. I have been around the globe three times this year. I have the utmost respect for anyone who’s vegan. I’m not, although I have tried, and continue to try to be vegan. That’s one of the things that will save this planet, I understand and agree with that. I don’t eat meat, but when I leave here I’ll be living in the jungle helping with the rescue and rehabilitation of dolphins. There are no vegetables, no restaurants. I will be surviving as the dolphins survive. I have to catch my own fish for the dolphins and for myself. If I don’t eat what the dolphins are eating, I don’t eat. That’s not an excuse, veganism is the way to go, there’s no question about it. I respect anyone who can do it. Both my wife and my 6 yr old daughter are vegan. I know you must feel a tremendous debt towards dolphins, but veganism is about a philosophy of respect to all life forms, not about transitioning to a plant-based diet. If you respect those values, does that leave you feeling horribly conflicted about not making that decision to stop harming other animals, and live according to your own stated values? If you show preference to one species – dolphins – Isn’t that exactly what we should be fighting against? I live with this conflict constantly because I recognise that the fish has just as much right to life as the dolphin. But I put the dolphin in this sea pen and the dolphin has no ability to catch the fish himself. If I don’t catch the fish for the dolphin and eat the same food myself, we all starve in the jungle together. Once they’re rehabilitated and released, they can hunt on their own. The reality is those dolphins will hunt for fish. Ric, there are groups such as “Boycott Japan, Save the Dolphins”, which seem to conclude that all Japanese citizens should be held accountable for the actions of less than 100 people. This attitude could be seen as a form of racism, what are your thoughts on groups such as these? I agree, it is a form of racism. You can’t blame all the Japanese people for this. Almost 127 million people don’t even know this is happening. Most of the Japanese citizens have no connection to whaling and shouldn’t be blamed for a small minority of people. You have a situation in Queensland, or the US west coast, Washington, Oregon, California, etc, where there are a lot of Asian American children. Some kids can be very cruel in the playground. I know of cases where kids have been beaten up and called “Jap whale killers.” We have to find a way to work with the Japanese people, not against them. It’s mentioned on the website “Save Japan Dolphins” that you have personally rescued at least 25 dolphins from captivity. In all those rescues, and any others that you may have been a part of or have personal knowledge of, are you aware of any violence against any person or other living being that was a direct result of those rescues and rescue attempts? Direct violence? No, but in every one of the releases, Guatemala, Haiti, Nicaragua, Colombia, and others, there is always a degree of conflict and stress. Confiscating animals from circus owners makes them become very angry. We have armed guards in places like this. Actually, there was one man in the Solomon Islands, from the Earth Island Institute who was abducted and beaten to close to death. On another occasion, two associates were murdered, not during a rescue, but for speaking out against captivity. They were trying to stop a dolphinarium, one in St Kitts, and the other in Tel Aviv. So yes, there have been occasions we’ve experienced violence, but never have we been the aggressors. Our work must be done in a peaceful, non-violent way. What are your next plans for the Taiji dolphins, and how could a young person help? What do volunteers do when they travel to Japan? That’s a very difficult question, I hear that question often. I would need to find out more details in order to answer it comprehensively. The problem is in Taiji, but the solution is in Tokyo. We are working with LOM – Leading Opinion Makers. We’re trying to get them to ask the same question “What can I do”, because this problem can only be solved by the Japanese people. It’s starting to happen because I was there last week with Sting, and he said all the right things, and began to get through with the media and the Government and so, the Japanese Govt. are about the same age as Sting and all grew up on Western Rock and Roll and they all love Sting, who said all the right things at the interviews. Has anybody thought of repelling dolphins from the area, so the fishermen could not find them and come back empty-handed? Some techniques have been used to prevent bycatch in nets, like pingers. Yes, we’re working on that but it’s extremely difficult as these dolphins are transient dolphins, not resident. They’re travelling many many miles to get there. You mentioned earlier you felt the issue in Taiji was getting worse, why do you think this. Only they can make the changes, they must be the ones to change. If we turn up with a big stick and the “Screw the Japs” attitude, you’re not going to win the hearts and minds of the Japanese people. Japanese media pick up on this attitude and dismiss us as being “all the same” ~ It plays into the hands of the fishermen. There are many groups there and some are just doing fundraising, some are talking past the Japanese people and directly to their website. We have to identify who “they” are. The groups I send there are compassionate and try to get the Japanese people to take ownership of this issue. Some others go there and insult the Japanese citizens, but their media group us all together. There’s too much interference by too many groups? Here’s the thing, there are 3444 people living in Taiji, there’s only 26 men who are killing the dolphins plus another 50 who work in the slaughterhouse, so we can’t blame all of the innocent people in Taiji for the very bad deeds of this small minority. We want to isolate that small group from the rest of the population. (from ARZone member Juergan) What’s your programme next time? We will go together with Andy to Turkey (in April 3rd to 11th) to visit all dolphinarium and to have a protest in front of them. We have to shut them all. I hope we will be till to 1.000 people as T.media wrote. (To ARZone member Juergan) Hi Juergan. Everyone should know that Andy and Juergan are two of the most effective campaigners in Germany! I can’t reveal what my next project is, I have to keep it secret as if I announce what I’m doing there will be people there to sabotage my efforts. We have a lot of detractors, so I can’t broadcast my plans. Turkey is a huge problem, but I have to finish what I’ve started in the jungle. Are you involved much with Sea Shepherd’s cove guardians, and do you think that these girls are very brave, considering their age, to be there fighting to spread the word of what is happening in Taiji ? If so how do you rate their efforts? I’m not involved with SS in Japan as we have a different strategy. I’m opposed to “Boycott Japan, Save the Dolphins.” I respectfully disagree with that. Paul Watson and I have agreed to disagree on this. The Japanese people are not guilty, to boycott them is a blanket indictment on all Japanese people and I don’t support that. I have a 6 yr old daughter from China who was confronted on the playground and called a whale killer, and she is not guilty. That’s the by product of this, innocent people are targetted. Yes. We all know why. I don’t know, I honestly don’t know. Perhaps if we switch to solar, wind power, other alternatives besides coal. I hear you say the problem is with the people in Japan that are doing the capture/killing and with Tokyo (government/masses of people to make gov. act). Granted, if no one would do it or the gov. banned it, the capture and killing would stop, but aren’t the people and the government supplying to meet a demand? Govt.s protect corporations, not people and other animals The solution to this problem is with consumers. Consumers must stop buying tickets to dolphin shows. It’s all about supply and demand. So, our work is about connecting up with consumers, and asking them not to buy tickets. That’s the only solution I can see … supply and demand. As you’ve been fighting to save dolphins for so many years, where do you find your strength to carry on? How do you fight against losing hope and be optimistic? I’ve been doing this for 40 years, I’m now 71 yrs old, and I just keep doing it. I don’t think about it any more, it’s all about just showing up. Thank you, Ric, for your time and insight today. It was very refreshing to be surrounded by like minded people today. I’m usually surrounded by people who hate me!